By air. Palermo has an international airport with national and international connections. Recently, also Trapani is offering national connections to the major Italian cities. Arrival (on April 30) and departures (on May 9) transfers are provided by the EMFCSC. Transport from Airport. Participants must communicate to school_fpricci@its.me.cnr.it their arrival and departure times and flight numbers of their arrival in the Travel Form by April 1st. On the official arrival day (30th April), transportation from Palermo or Trapani airports to Erice will be provided by the EMFCSC. A limousine or a bus of the Ettore Majorana Centre (EMCSC) will be available, provided you have properly filled and returned the Travel Form no later than April 1st. 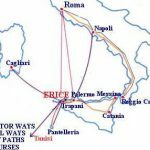 On your arrival at the airport you shall look for the driver of the EMCSC who is waiting for you and shall carry you to Erice. He will be there showing around the poster of the International School of Solid State Physics. Missing driver. In case the driver is not there within half an hour after your exit from the arrival area, you should call the Secretariat of the EMCSC (phone no. : 0923 869133) for instructions. NB: the cost of a trip to Erice by taxi is rather expensive and may not be reimbursed by the organizers unless the trip has been authorized by the EMCSC. Participants arriving at Palermo airport should look for the “Ettore Majorana” meeting point inside the arrival exit where the EMFCSC driver will be waiting. 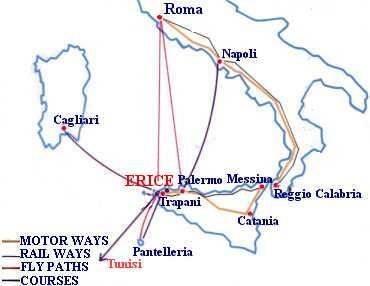 Participants to the School must arrive in Erice on 30th April, not later than 12:30 a.m. Participants should register upon arrival at the Centre Secretariat (I.I. Rabi Institute). On the official day of departure (May 9), transportation to Palermo or Trapani airports will be provided by the EMFCSC.